Today I am joining up with a bunch of other bloggers to share projects made with our Cricuts. A while ago we all got a box filled with lots of fun stuff, different kinds of vinyl and paper as well as some other things. At the end of this post you can see all of the projects that everyone made as well as enter a giveaway to win the same box that we got. Our challenge was to make something using at least one of the products in the box. It wasn't really a challenge to come up with and idea, for me the more challenging part was to choose which idea I was going to go with. One of the products in the box was something I had never used before, in fact I had never even seen it before. 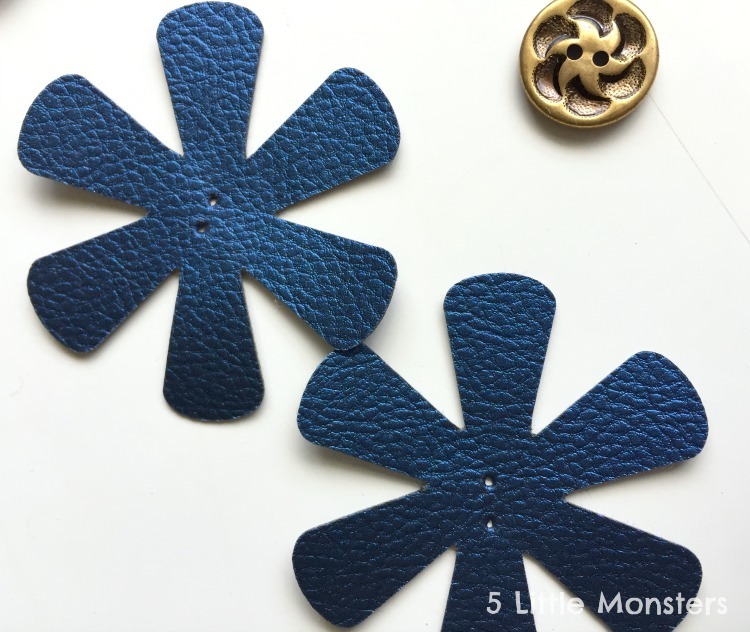 It is a faux leather that is really thin so that it can be cut with a regular blade. You don't need a deep cut blade like you would to cut real leather. I thought it seemed like it would be something fun to try. The other thing is I felt like the textures and colors had a very fall feel so it seemed seasonally appropriate. 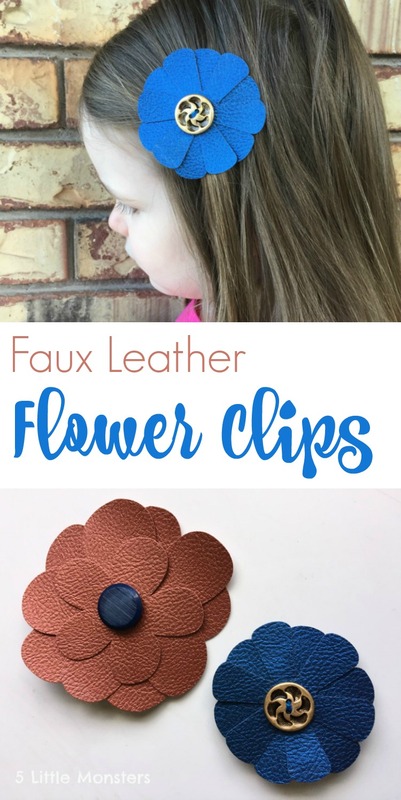 I thought that the faux leather would make cute little flowers that could be made into hair clips for my girls or used anywhere else you might want flowers. They are super easy to make, just cut a couple of flowers and layer them together. Then add a button for a cute center. After that you can add it to a hair clip or headband or whatever else you want. 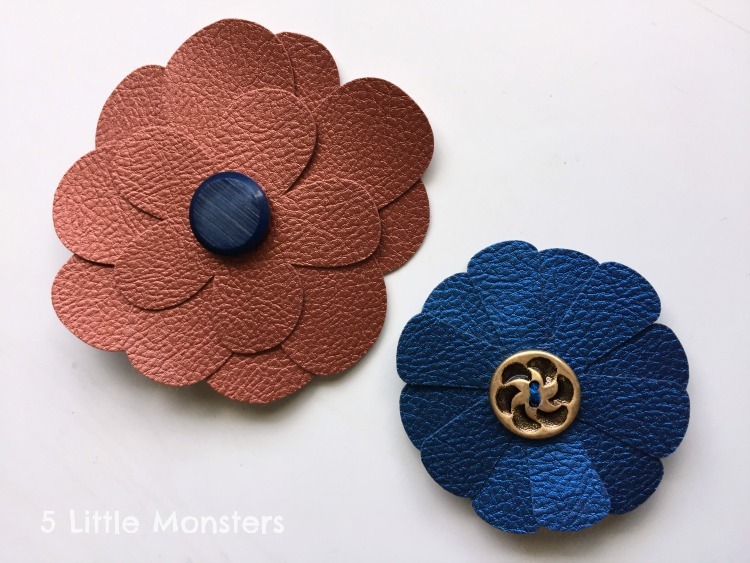 I made a couple different styles, one with the blue faux leather that has 2 layers, and a 3 layered flower out of the coppery colored faux leather. 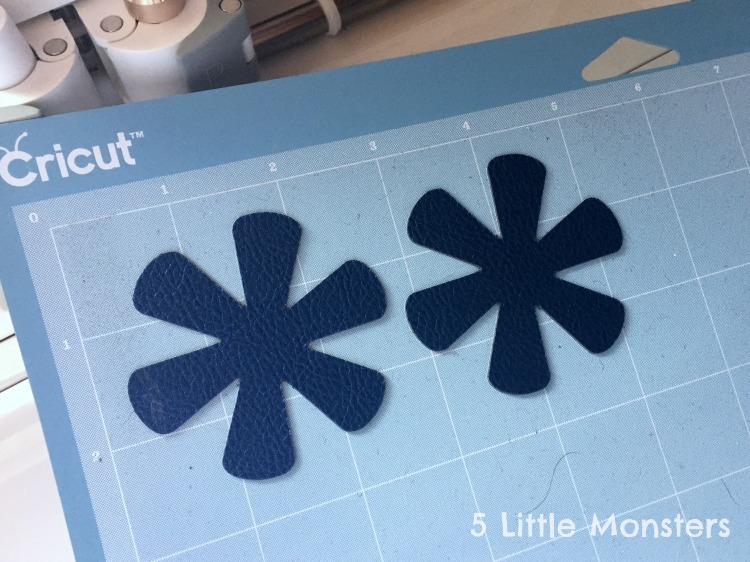 First cut out your flowers using your cutting machine. Then choose your buttons. One of my buttons had two holes, the other was a shank button. 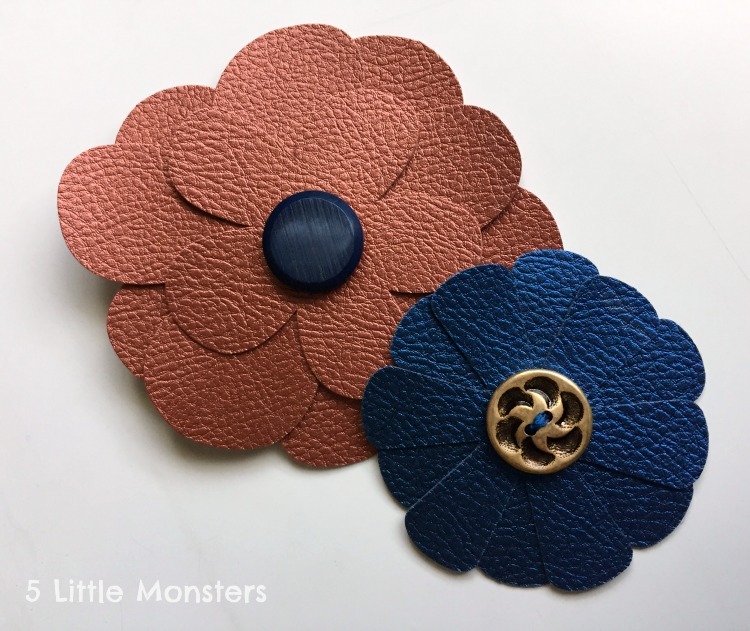 I used a large needle to poke holes in the leather where I was going to sew the button on the blue flowers and in the center where I wanted to poke the shank through on the copper flower. 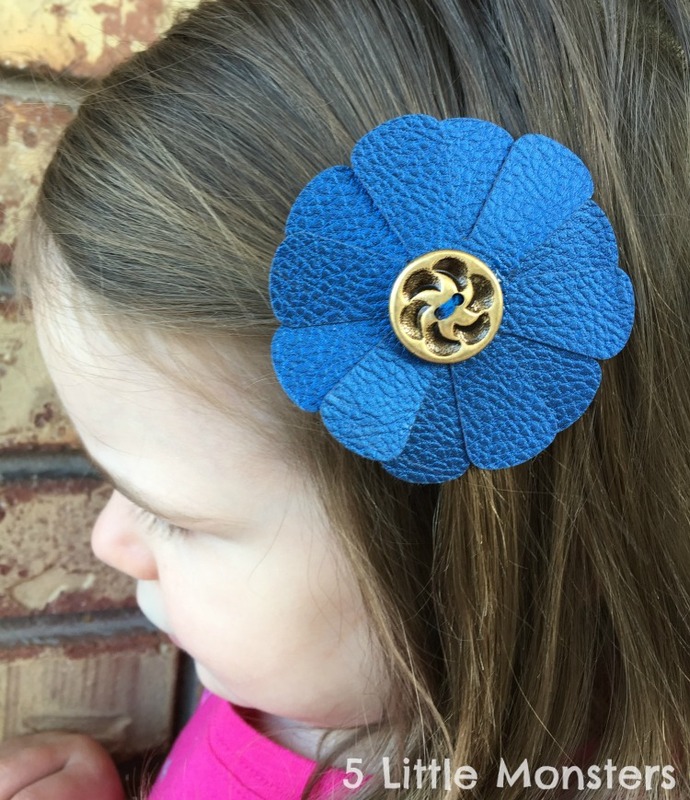 You do not need to sew the button on because you will glue everything together, I just added stitching to the blue flower because I liked the way it looked. The next thing I did was attach the buttons and arrange the flowers the way that I wanted. With the blue flower this meant sewing the button on, with the copper flower I just poked the shank through the hole I had made in the center of all the layers. Then I added a little bit of glue in between the layer to secure them in place. The last thing to do is attach the flower to whatever you want, in my case a hair clip. I just used hot glue to glue the clip to the back of the flower. 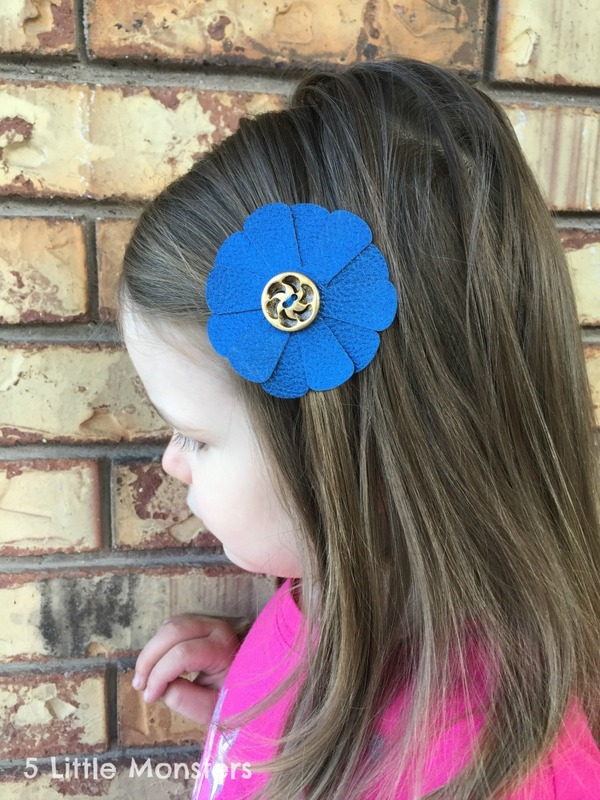 It only took a couple of minutes to make them so it was a really quick, fun project and my daughter loves her new blue flower clip. Super cute! I love the faux leather! These are awesome! I actually just made something similar yesterday to share next week. These are so adorable! I love the new faux leather!